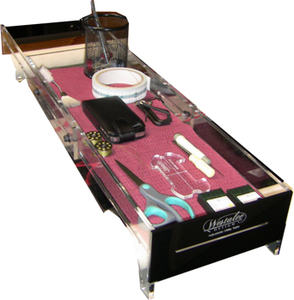 For all those things you want to reach quickly, (or find) when your are quilting, we have manufactured a practical sized Utility Tray. 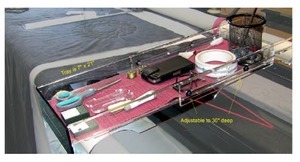 Adjustable to fit even the largest Quilt Table. Sitting over the rollers and next to your work. Made from 6mm Acrylic a great way to keep your workspace where you want it, nearby. The tray is 7'' wide and is adjustable from 21'' up to 30" deep. Is your quilting frame (or carriage) made of metal or wood?